When planning mine and Scott’s drive from Ontario to Vancouver back in February 2015, I know the one place that I really wanted to stop in was Banff. I had been here before with my family, though only for a short time, so I knew how beautiful it was. A quick stop in Banff, Alberta was exactly what we needed. A little past Calgary, Banff is a small town in the Canadian Rocky Mountains and is beyond picturesque and can charm the pants off of anyone. Throughout the year different festivals are held in the town. It is the prefect tourist destination. Scott, having never traveled before, kept telling me that there was no need for an over night stop and that we should just pass through to continue our journey. Each time I would just laugh and tell him that he would understand once we arrived. 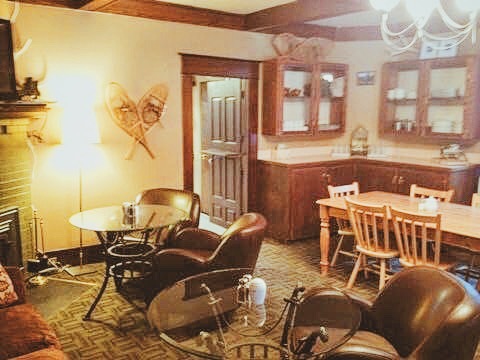 We stayed at the Rocky Mountain B&B in a basement suite that had a living area/kitchenette, and a partly separated room and small washroom and shower. This room was perfect for us. We had plenty of space for all of our belongings, a very comfy bed, and if we had wanted we could have used the small kitchenette to our advantage. Upstairs was the common area with TV, couches and tables. This area was also where the breakfast was served in the morning. More about that later! For dinner, Banff has loads of options! You will never go hungry here. In the end, we had tacos and rice at Magpie & Stump. The next morning we had a delicious breakfast from our B&B. We chose a small table with the most beautiful view of the street and the snow, and were served quickly. The owners of the B&B were so lovely and worked really hard. If you weren’t in the mood for a hot breakfast cooked by them, there were lots of bread, pastries or cereals and fruit to choose from. After breakfast we were sad to have to leave. We both spoke about how we wished we could spend more time in Banff, and how we need to go back. After leaving the beautiful town, we headed on our way to our next stop, Kamloops. Here are all of the photos I took during the previous day while we were walking around all of the shops on the main street of Banff or driving around the area. As always Banff, you were beautiful and amazing. We cannot wait to head back and stay again at the Rocky Mountain B&B and explore some more! Have you ever been to Banff? Do you love small mountain towns?